The first recorded Burton postmark was 8th October 1722. It arrived at its destination in London two days later. The postage cost, based on mileage, was sixpence (6d) which the recipient had to pay on delivery. 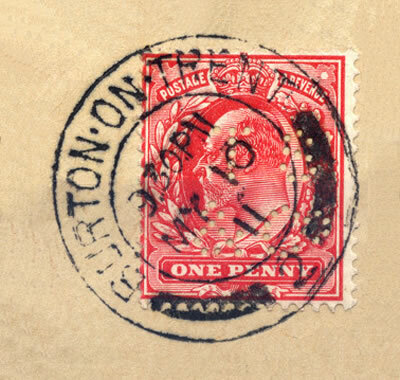 The postmark appeared as BURTON REF 1, which continued to be used until 1768. Up until 1765, Burton mail from London only travelled as far as Lichfield where it had to be sorted. In 1765, a number of Staffordshire Members of Parliament, including the MP for Burton, presented a petition to the General Post Office in London complaining both about the service and the high charges added by Burton postmaster, William Stratham. The London to Lichfield postal charge was 4d, but Mr Stratham applied a 2d charge from Lichfield to Burton which was thought of as very unreasonable. It was customary at the time to reply the same day and a further 1d was charged for the return journey. This meant that Burtonians were paying 3d more for the same service available in Lichfield or Derby. In 1765 therefore, the Post Office conceded and introduced a new sorted bag for Burton, avoiding the excess charge. The new bag however, still had to be collected and returned to Lichfield although postmaster Stratham was allowed an extra £60 a year to provide a man and two horses for both Lichfield and Derby. Horse delivery continued until the Mail Coach System was introduced in 1796 when Burton at last enjoyed its own direct mail service. The route ran through Lichfield-Burton-Derby-Nottingham-Newark; Newark provided the link to the Great North Road which ran up to Edinburgh. The coaches ran to a tight schedule and postmasters at each office signed for each collection and despatch, recording the time. The earliest recorded local collection service within Burton was 1816. It did not however, prove to be viable and was fairly short-lived. The post office in 1818 was at the George Inn in High Street. 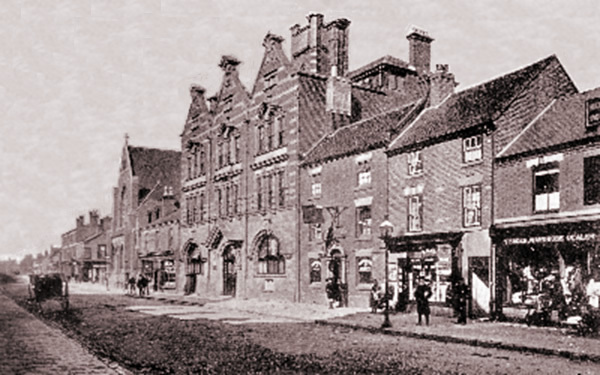 In 1834 it moved to the Three Queens Inn in Bridge Street but was moved back to High Street in 1841. It still stood next to the George in the later 1850s. 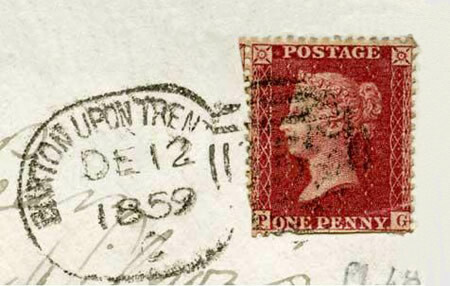 Above shows an 1859 Buron upon Trent postmark and a One Penny stamp of the time. With several collections a day, this was probably being sent to someone else within the town to be read later the same day. 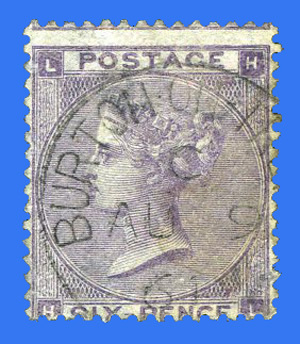 The above stamp, with a Burton postmark dated 9th August 1861, is a Six Penny ‘Lilac’. For half a shilling, this would almost certainly be for a package rather than a letter. 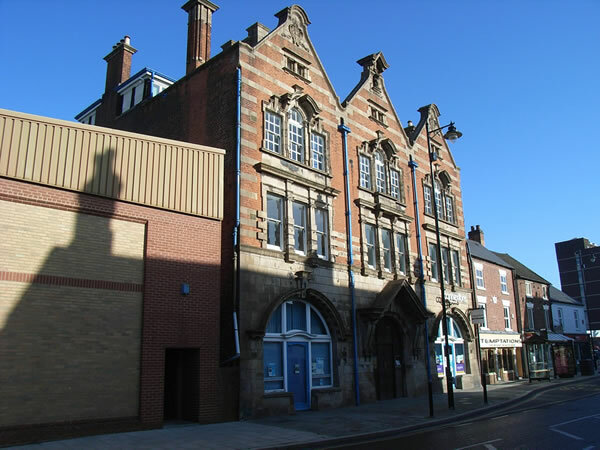 In 1874 the main post office at 162 High Street had Mr Gibson Bowie as Postmaster, William Stone as chief clerk, nine clerks, two stampers, one porter, eight letter carriers and nine rural messangers on the staff. By this time, aside from the main post office, there were ten ‘receiving houses’. These were situated at Newton Road (bottom of Bearwood Hill), Bridge Street, Horninglow Street, Derby Turn, Victoria Cresent, Station Street, Moor Street, Uxbridge Street, Orchard Street and Branston Road. 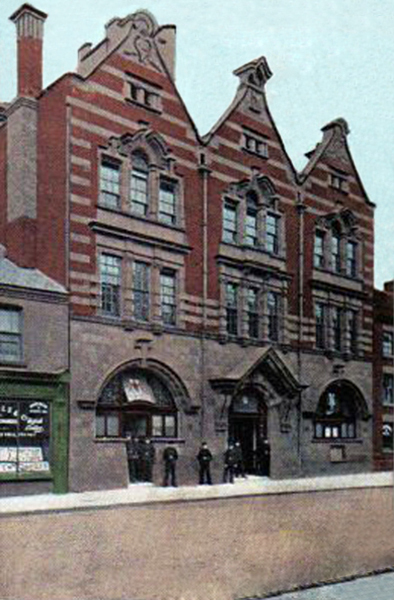 In 1877 the office was moved to a new building on the site of Parker’s Almshouses on the east side of High Street which was later to become the Constitutional Club. 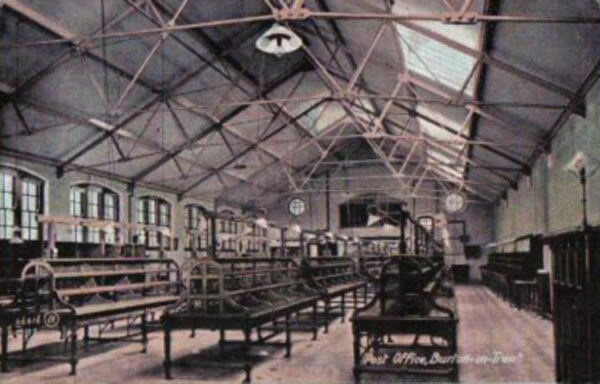 In 1905, it moved again to new premises in New Street. These were built by R.Kershaw Limited which, just two years earlier, had built the Fire Station across the road. 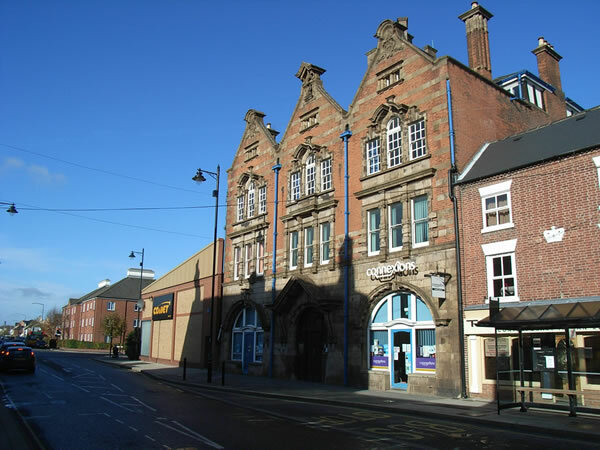 At the time, there were 12 sub-postoffices in Burton. 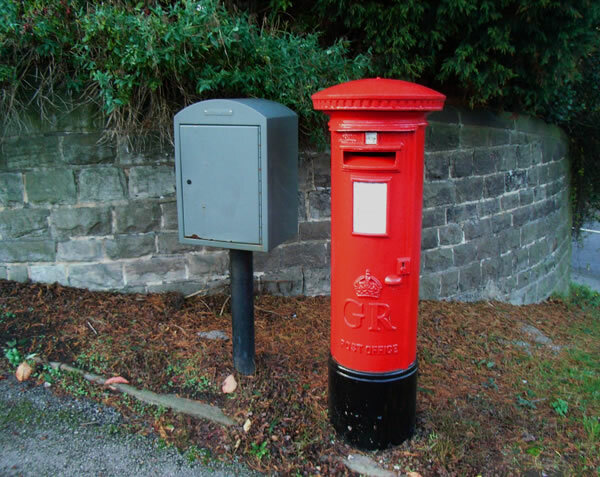 By 1912, there were 19 sub-postoffices distributed around the town but also, a combination of 38 wall and pillar boxes strategically distributed around the town. A few original ones survive characterised by having the Edward VII insignia on the front. Though most of the original sites are still in use, most boxes have been replaced. It was not uncommon for someone to call for the doctor by sending a postcard! Before you scoff however, there were eight collections every day except Sunday, when there were only two. 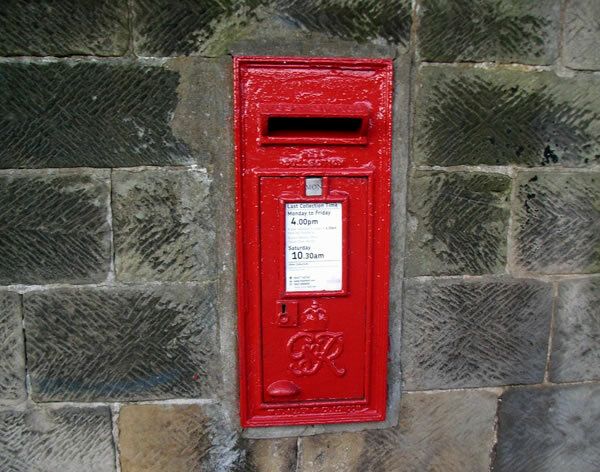 Letters posted in the morning would often reach their local destination before lunchtime and very often, replies were received on the same day. No local post would of course, ever leave Burton unlike todays logistics. Messenger boys were also available for delivering urgent messages or parcels for which they would receive three farthings. The building can still be seen little changed over 100 years later, alongside some delighful modern architecture (?!). 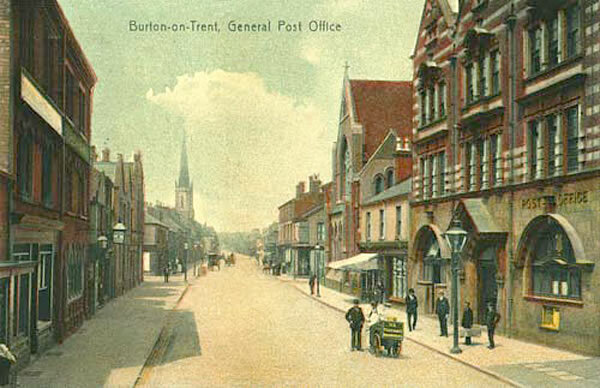 The General Post Office has been the subject of a number of early Burton postcards.